We’re kickin’ off the Fiddlers Convention early on Friday, Aug. 3 with a Summer Brew Jam at Big Bottom on Country Club Ln. Adam Steffey (The AMAZING mandolin player for Allison Krauss for years) & The Highland Travelers will entertain us with some great bluegrass music! Admission is $10, the patio is first-come first-served. 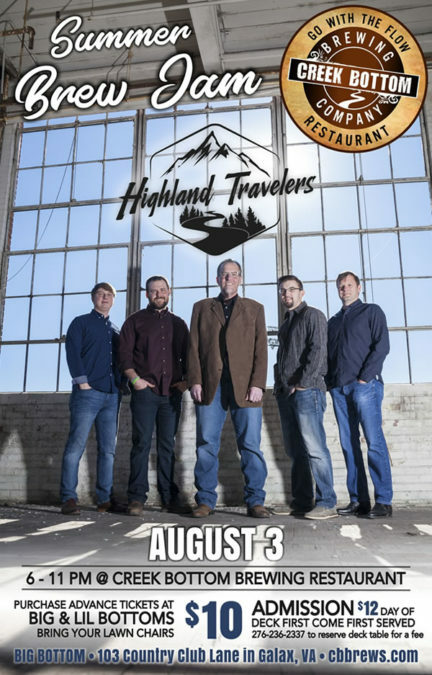 The Highland Travelers motto is “We like to stay true to our traditional grass roots while creating new, original songs, as well as putting our stamp on our classic favorites.” Cold craft beer, hand tossed pizza, wings and fun will be flowin’ at the Bottom! Advance tickets are $10 and can be purchased at either Creek Bottom, or opt for the $12 cover charge at the event day-of. The deck is first come first served, so be sure to get there early! You can reserve a table on the deck for a fee. Call 276-236-2337 for more info.